The global diabetic injection pens market is projected to witness a steady rise in the coming years, as reported by Transparency Market Research (TMR). With an overall consolidated vendor landscape, the market presently comprises of a handful of established players, who are predicted to retain their dominance in the forthcoming years. The market players are foretold to focus on implementing the latest technological innovations in order to come up with a unique product portfolio. Leading names in the global diabetes injection pens market include Biocon Ltd., Eli Lilly and Company, Sanofi S.A., and Novo Nordisk A/S. 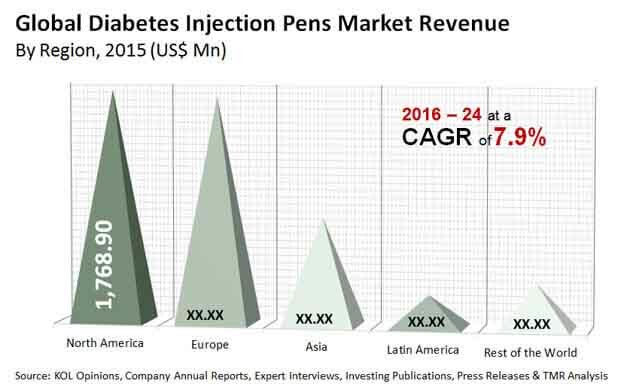 Between the forecast duration from 2016 to 2024, the global market for diabetes injection pens is expected to exhibit a steady 7.9% CAGR. The market, which was estimated to be US$4.9 bn in the year 2015, is anticipated to reach a valuation of US$9.7 bn by the end of 2024. Based on product, the segment of insulin pens is expected to show predominance over the pen needles segment over the duration of forecast. Insulin pens exhibit ease of use as contrasted with syringes and pumps, thereby seeing maximum uptake. The insulin pens segment is projected to grab nearly 64.8% share of the market. Presently, based on regions, North America holds a substantial market share. This is ascribed to the awareness levels among the population regarding the disease and its control. According to statistics reported by the American Diabetes Association, in the year 2016, the U.S. alone registered nearly 30.3 million patients were diagnosed with diabetes, making up for almost 9.4% of the total population. Additionally, the BMJ Open Diabetes Research & Care report that roughly 387 million people over the globe are plagued with diabetes, and among them, nearly 5-10 percent suffer from type-1 diabetes. Additionally, the use of needle-sticks render the patient prone to bacterial infections, and exposes them to the risk of needle stick injuries. This is another factor which could work in favor of the diabetes injection pens market, as the use of this technology is relatively risk free and painless. The growing inclination of users towards alternative drug delivery modes could a major hindrance to the market. Moreover, emerging economies are plagued with issues of poor reimbursement schemes offered by the administration. However, the rising prevalence of chronic ailments, support from governments toward improved reimbursement and growing number of regulatory approvals are expected to overcome the market shortcomings and push the growth of the global diabetes injection pens market.